CONDITION REPORT: Overall excellent condition. The case is unpolished with a stunning dark black dial and cream patina of the lume. Original vintage pulsations bezel is slightly faded but intact and flat foot crown is original, case back engraved with original owners name (matching paperwork). Notes: This watch is complete with its box, outer box, papers and original invoice. Papers have matching name with the case back of the original owner. The full set also includes the a second original dial for this watch separately. The dial on the watch is correct for the Ultraman series, but an upgrade. According to the Omega Museum, the present example was delivered in 1968 to Denmark with the special orange hand. Ultraman is a Japanese fictional superhero that was the protagonist on a popular sci fi TV show from 1966 to the 1970's. 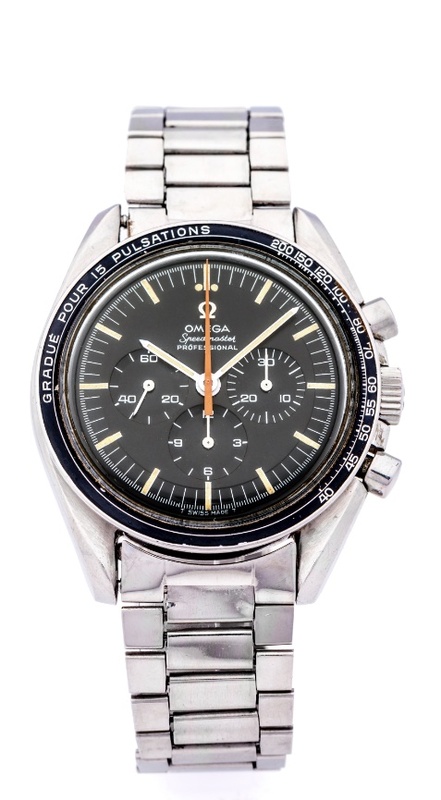 The Omega Speedmaster with the orange center seconds hand appears in the show and the production series is limited to only 145.012-67 case reference within the 26076xxx-26079xxx serial number range. In addition, although there was no specific country of delivery (spread out) all examples were delivered in June of 1968.